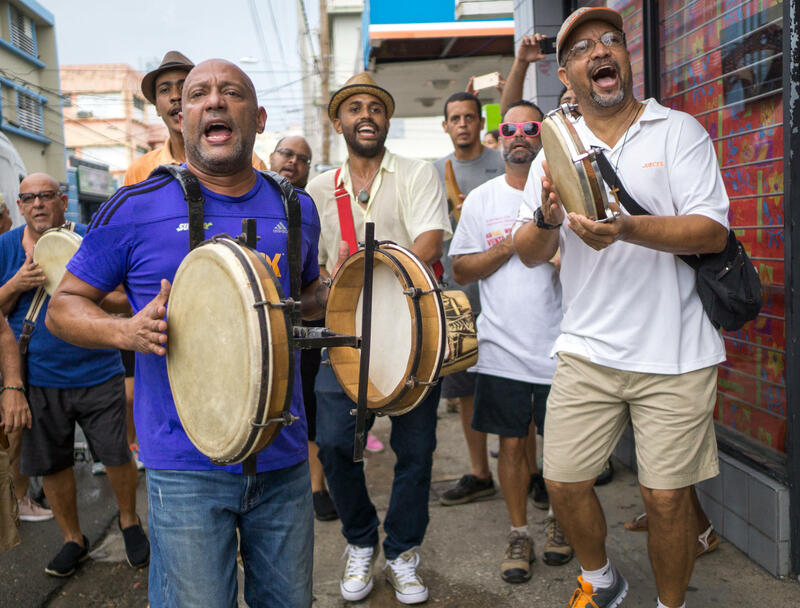 Hector René "Tito" Matos (left), leads a celebratory plena musical bar hopping jam session along the trendy Calle Loiza neighborhood in San Juan, Puerto Rico. 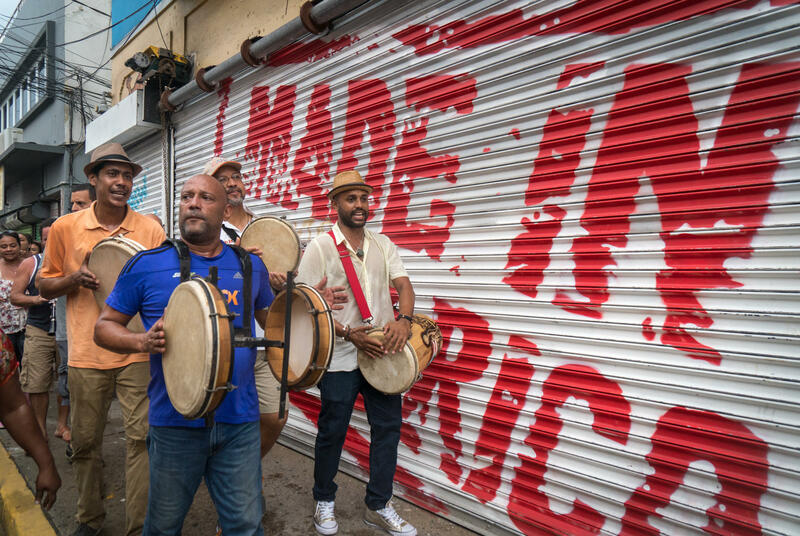 Plenas are "very, very Puerto Rican," says Emanuel Santana, a singer with the bands Plena Libre and Viento de Agua. Tito Matos' son Marcelo Matos Reyes, 3, holds a guiro, a percussive instrument, as part of the Plena. Plenas are sometimes known as "singing newspapers," giving the latest updates on what people are feeling and news of the day. "Love Mother Earth, respect of nature, you know, environment," he says, with his three-year-old son at his side. "Trying to use the moment to also teach the young generation these hurricanes are coming faster, bigger and stronger than ever, and that's because of us." 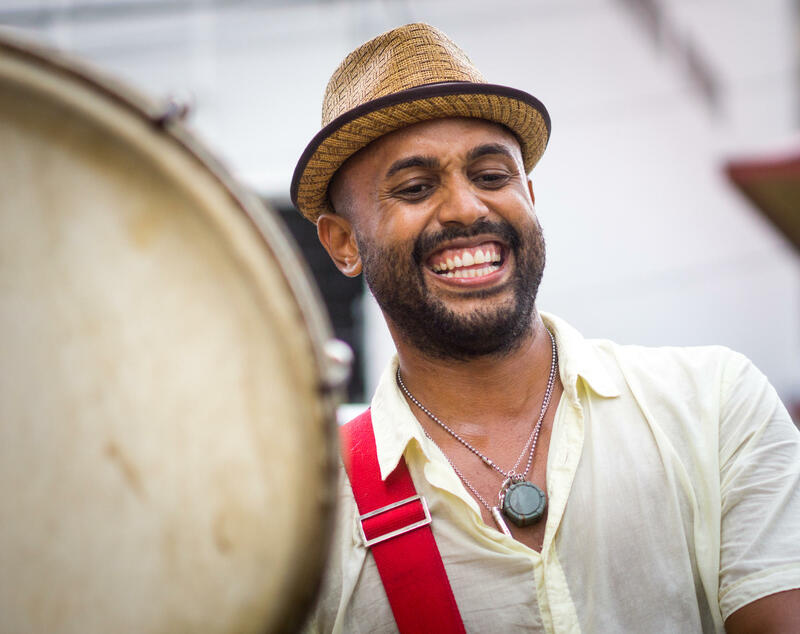 Matos is a member of the New York band Los Pleneros de la 21 and founder of Viento de Agua. 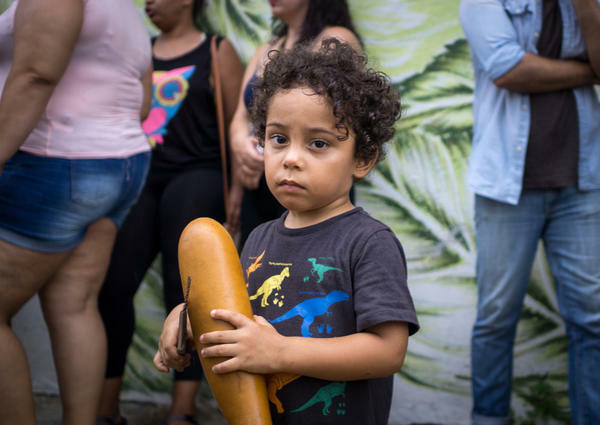 He's recorded and toured with well-known musicians Eddie Palmieri, David Sanchez and Ricky Martin. He also owns a restaurant in Calle Loiza called La Junta. The wooden building was demolished in the hurricane. After the storm, it was vandalized. "I have to deal with the issues of the hurricane and also go back every day to try to salvage some stuff," he says. "But look at my face: we are happy. I mean, we are alive. All my family members are fine and well. And we can rebuild." "We're all on standby," says Missy Adamus, a chef at La Junta. She says they are trying to rebuild the restaurant, their homes, their lives. But at least they still have their music. "Music has brought back to life what was dead in Calle Loiza," she says. Plenas are sometimes known as "singing newspapers," giving the latest updates on what people are feeling and the news of the day. The headline of this week's plenas was about the devastation of Hurricane Maria. NPR's Lauren Migaki contributed to this report.